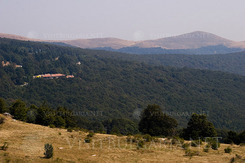 Buzludja mountain, history and ski resort in Bulgaria, near Kazanlak and Stara Zagora in Bulgaria. Buzludga peak is situated in the heart of Natural Reserve "Bulgarka" in the Balkan mountain range, just 20 km away from Kazanlak. Buzludja peak is 1441 m high. The aria right beneath Buzludja peak offers a small and very well maintained ski zone on 1180 m altitude with ski slopes for beginners and intermediates, serviced by five drag lifts. Snow canons provide artificial snow when needed. Apres ski bar, right next to the lift offers refreshing drinks and comfort during the hard day on the slope. Three cosy hotels and one very well kept chalet offer accommodation in the site. The road to the ski zone is asphalted and is very well maintained during the winter months. As a whole the local ski zone is perfect for beginners, however you can find other interesting activities to entertain you during your stay in Buzludja. 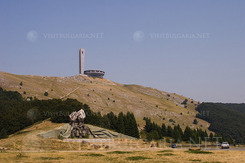 The sight from the panoramic building is just unbelievable, as the whole Thracian plain reveals before your eyes and the Shipka monument proudly perched on the other side of the mountain can also be seen on a clear day.